Okoye is the general of the Dora Milaje and the head of Wakanda's armed forces and intel. She finds herself torn between her allegiance to her country and her king when T'Challa begins to challenge ancient Wakandan traditions and rules. Like Nakia, Okoye first appeared as one of T'Challa's bodyguards in the '90s Marvel Knights Black Panther series. Christopher Priest invented the Dora Milaje, and simply introduced them as if they'd always been there. In the movie, Okoye hails from the Lesotho-inspired Border Tribe, if her relationship with the guy from Get Out is any indication. The character stopped appearing in the comics in the early 2000s, when that volume of Black Panther was cancelled; but like so many things (leather uniforms for the X-Men, Spider-Man's organic webshooters, Pepper Potts, the Chitauri, Star-Lord's jacket, so on and so on), the fact that she turned up in a movie meant she was soon back in print, and has now been put in charge of the Agents of Wakanda, a secret support team for the Avengers. Okoye is the Build-A-Figure for the Black Panther series of Marvel Legends. Buy five of the six figures (you don't need the Invincible Iron Man), and you can assemble her. Getting the legs on is a little tough, because of her skirt, but once she's all together, everything molds tight. 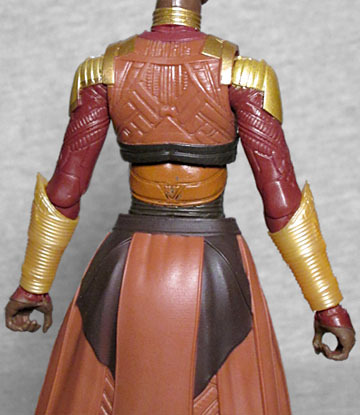 Although the two look very similar, no part of Okoye's sculpt is shared with Nakia. Presumably she gets a unique outfit because she's the commander of the Dora Milaje, so she needs to stand out from the crowd. The detailing in the sculpt is highly intricate, with geometric patterns to be found on every inch. There's light armor on the forearms and shoulders, and rings around her neck. Keeping with her dislike for heels, she's wearing flat shoes, and the fact that her skirt is just in the back leaves her legs free and unimpeded for kicking the butts of anyone who would threaten the king. Okoye was played by Danai Gurira, aka Walking Dead's Michonne - though if you suffer from prosopagnosia (aka "face blindness") and rely on easy visual cues to identify people, you probably may have some trouble recognizing her without long dreadlocks. 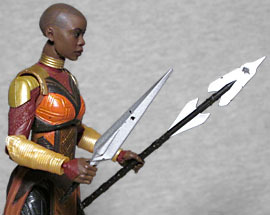 Okoye goes bald, but her scalp is decorated with paint or tattoos or some other kind of marking. The sculpt is great, and she uses the new "face-printing" technology so she looks amazing. Despite being a BAF, the figure moves as well as any standard release. She has a balljointed head, hinged neck, swivel/hinge shoulders, elbows, and wrists, a balljointed chest, balljointed hips, swivel thighs, double-hinged knees, and swivel/hinge ankles. The hinges in the wrists run palm-to-back, when thumb-to-pinky would be better for her accessories. 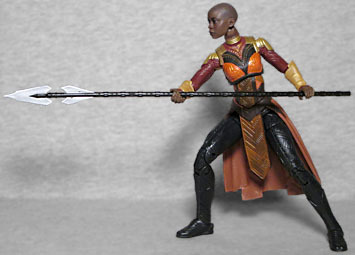 Okoye prefers a traditional vibranium spear, and she comes with two of them: one fully extended, with a weird two-piece tip, and the other collapsed with a more normal spear tip. Os is that some kind of sword? Whichever. The blades are painted silver, but the paint scrapes away very easily, leaving big dark blemishes on them. And again, since her hands are made the way they are, she can't point either of the weapons naturally. The Black Panther figures were released way back at the beginning of last year, but since we (usually) wait to review BAFs until we've finished reviewing all the toys in a series, Okoye's had a chance to appear in a second movie already, being a big part of Infinity War. It's clear why they made her the BAF - to make sure she was in stores - but it still doesn't answer the question of why this series was so heavy on the white dudes in the first place.